The Cedarville University School of Pharmacy’s first professional year is underway with an enrollment of 53 students. Seeing these students walk the halls of the new Health Sciences Center, it might be easy to forget about the vision that not only brought this program to life but also guides the program still today. Prior to 2009, three men on Cedarville’s campus, Duane Wood, David Ormsbee and Andy Runyan, had a vision for a pharmacy program that would create doctors of pharmacy who were highly skilled, innovative and compassionate. Under the guidance of these three men, students, faculty and staff believed in the vision of the program. One such person was the dean of the School of Pharmacy, Marc Sweeney, Pharm.D. 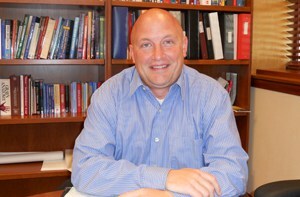 Sweeney was invited to the school’s advisory council with the goal of shaping the vision and direction of the program. Eventually he was recruited from the council to become the dean of the school. He is excited by the progress he has seen in the school in the time he has been involved in its development. Under Sweeney’s guidance, the School of Pharmacy has developed from a nice idea into a concrete program that develops students not only in the scientific realm, but also in the spiritual and interpersonal realms. The Cedarville University School of Pharmacy is the only pharmacy school in the nation where students are required to have a background in biblical studies. According to Lewis, another unique feature of the program is its heavy engagement with medical missions. The program requires every student to go on an extended cross-cultural learning experience during the last two years of their professional degree. Lewis said many students will complete this requirement through a medical or health missions trip to locations such as Kenya, Honduras, Swaziland and the Dominican Republic. The inaugural professional year class is laying the groundwork for future students, while at the same time walking on the paths laid out for them by those original three men and those they recruited.